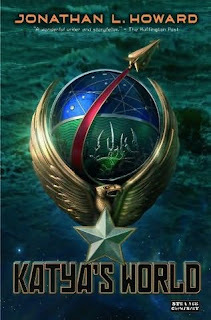 Katya's World is the first novel in Jonathan L. Howard's new science-fiction series Russalka Chronicles, featuring heroine and protagonist Katya Kuriakova. Howard has also written the Johannes Cabal series, which begins with The Necromancer. Before I go too far into writing the review for this book, I would like to mention that I did NOT finish this book. Not because it was bad, or terrible! But because as hard as I try, it's almost impossible for me to get into and enjoy science-fiction novels. I'm constantly on the search for that one science-fiction novel that will just hook me on the genre indefinitely, but it seems like an infinite, never-ending search. I normally don't write reviews for books I haven't finished reading, but because I contacted Angry Robot Books specifically for a review copy of Katya's World, I am following through on my promise for writing a review, which is, in fact, rather positive. The synopsis for Katya's World is very intriguing and original, and reminded me a lot of the movie Waterworld featuring Kevin Kostner. The prologue of Katya's World pretty much tells you everything you need to know about the book's setting, and the world of Russalka. When Earth became overpopulated and damaged by the human race, our robots sought out a new planet to call "home." However, the planet was comprised of all water and no land, so to see if there were any possibility of humans being able to live and thrive on Russalka, Earth dropped off a team of scientists to study the planet. Unfortunately, the scientists were "forgotten about" and left behind for good, so humans found a way to survive on the planet. Years into the future, 18-year-old Katya Kuriakova is training to become an underwater submarine navigator. On her maiden voyage at the helm of the ship's controls, Katya and her uncle pick up a dangerous criminal-pirate accompanied by a law officer. When their submarine becomes directed off-course, Katya is forced to escape death, with the criminal by her side. From there, she (allegedly) encounters a series of events that open her eyes to the truth behind the planet and future of Russalka. I made it through the first three chapters of this book before my eyes began to glaze over and my mind started wandering. My song and dance in regards to sci-fi novels is always the same - the sci-fi terminology and technology bits are way over my head, and my brain just fails to grasp anything that goes on. The premise of Katya's World is very exciting, but the day-dreamy side of me just couldn't stick with the intensity of and details behind the plot. Adults and teenaged fans of science-fiction will most likely enjoy Katya's World. The suspense and intrigue elements are definitely present throughout the first few chapters, and set up great expectations for the rest of the novel. If you read Katya's World all the way through, please stop by this post again and let me know what you thought of the novel! Jonathan L. Howard has also written The Necromancer, The Detective, and The Fear Institute. The title for the second novel in the Russalka Chronicles is yet to be released. What are your favorite science-fiction novels? Who are your favorite science-fiction authors? Share your comments with us below!